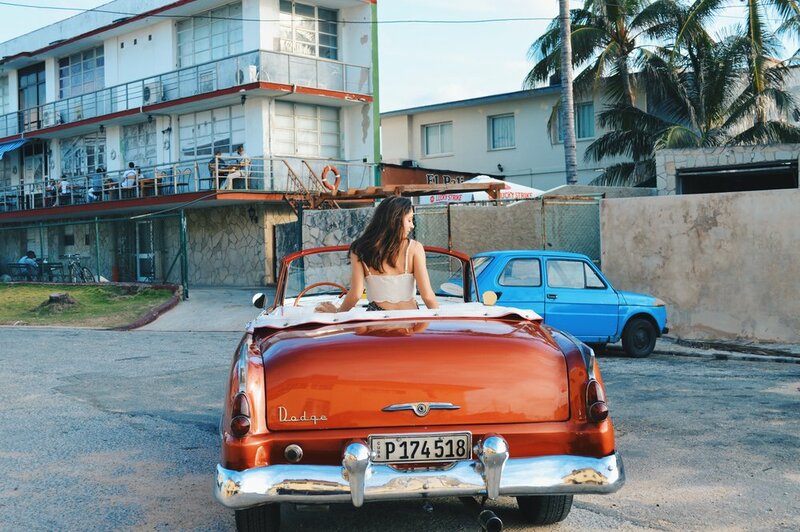 If you only have four days in Cuba then you’ve come to the right place! “Benvenidos a Cafe Cubano, how may I help you?”. A single quote from the musical Guys and Dolls that sparked my interest in Cuba almost fifteen years ago. Now you could argue it was the entire romantic evening set in Havana that sparked my interest, but it was the quote itself that stuck with me all of these years. Unfortunately my time in Cuba was quite limited so I was only able to see and do a fraction of all the things that I would have liked to. 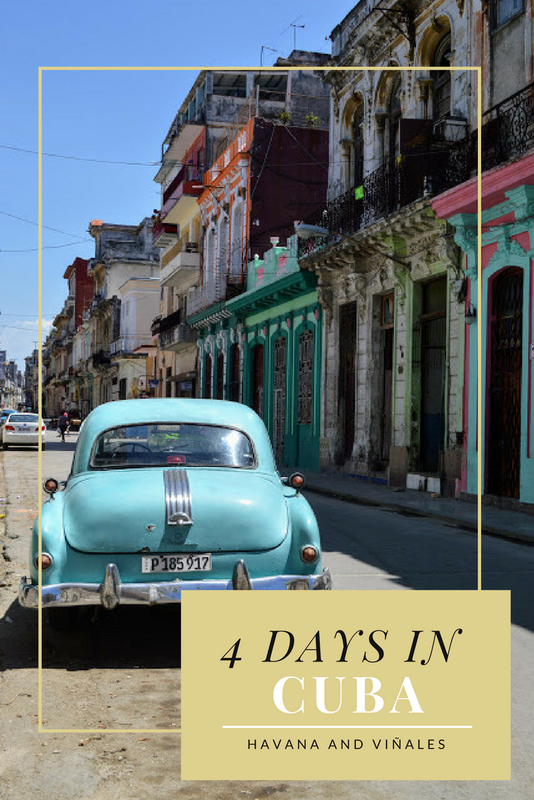 With only four days in Cuba, we chose to spend 3 nights in Havana, Cuba’s capital, and 1 night in Viñales. My experience of visiting Cuba was comparable to opening up a time capsule that my grandparents buried many years before my time. Havana in particular possesses this sort of dilapidated beauty. The buildings have crumbled and the facades have slowly been worn down over time, yet the city has lost none of it’s charm. Despite everything, the warm nights of Havana still have a heartbeat that is so very much alive – alive with potent mojitos and icy daiquiris, alive with brilliant music and rhythmic dancing. My four days in Cuba could not have been more perfect! What’s the Deal with the Visa?! The first thing that I will say to any Americans hesitant about visiting due to the “strict visa policies and border regulations is “just go”. 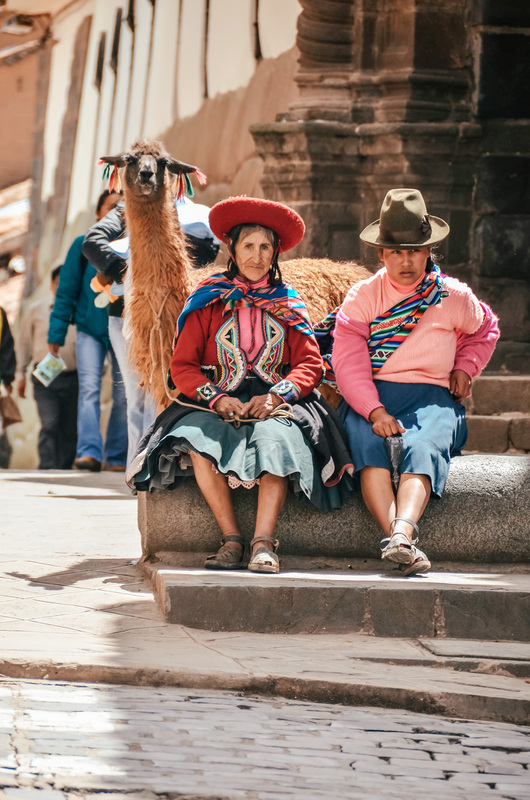 You do not need to book an expensive tour or travel with a group! In an act of spontaneity I booked my flight to Cuba only two weeks prior to my trip. Despite the time frame, there were ample accommodations available through AirBnb. Additionally, I was able to purchase my visa at the airport for $75 on the day of the flight. American credit and debit cards are not accepted in Cuba! For this reason it is essential that you bring along any money that you will need for the trip in cash. We found that you get a much better exchange rate if you exchange Euros rather than Dollars so that is definitely something to consider. 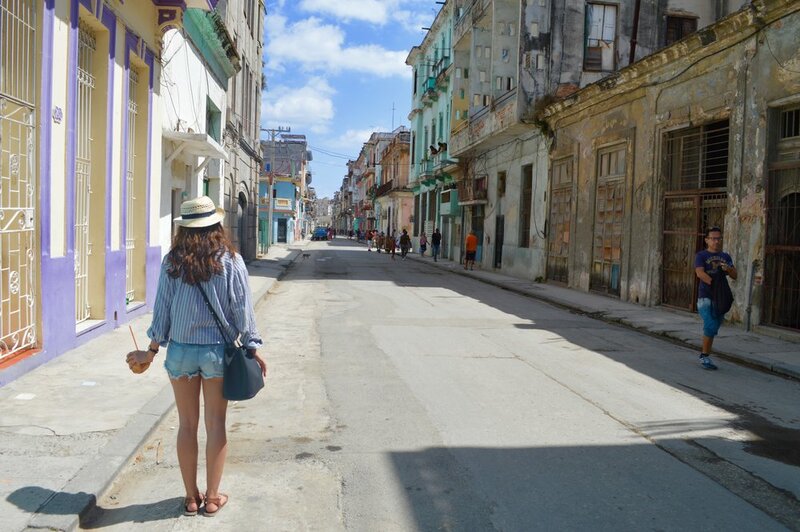 For four days in Cuba we budgeted for $100/day to be safe and spent considerably less than that! Although wifi is slowly becoming more readily available, it is still not easily accessible. If you only have four days in Cuba this shouldn’t be too much of an issue. In order to get online it was necessary to buy a 1 hour wifi card (2 CUC) and then find a local wifi park in order to connect. Plan ahead and make sure that you have your destinations and sites fully mapped out before arriving! One offline map that I have found particularly helpful is maps.me! 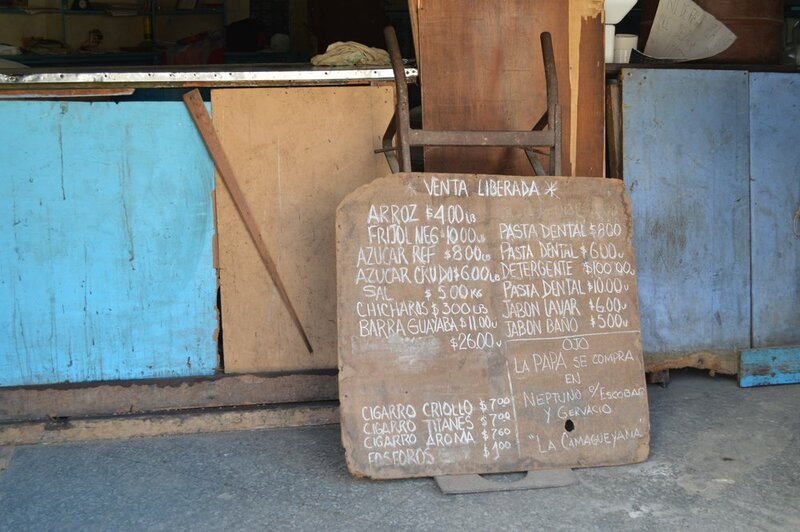 There are two types of currency in Cuba: the cuban peso (CUP) and the cuban covertible peso (CUC). 1 CUC is essentially equal to 1 USD, however the exchange rate for the CUP is currently 25 CUP per 1 USD. Make sure you note which currency you are paying in (and make sure that you are receiving your change in the correct currency as well). I will admit that I was thoroughly unimpressed by the Cuban cuisine. That being said, there are definitely a few spots that we tried during our four days in Cuba that you shouldn’t miss! Live music, reasonably priced cocktails, basic dinner fare. This place is right down the street from la Floradita, but you’ll get a lot more bang for your buck and a less touristy atmosphere. To be honest, we didn’t actually get a chance to eat at the main restaurant. We naïvely tried to make a reservation less than a week beforehand. However, we did snag a spot up on the rooftop bar and had a blast! The views are absolutely incredible, especially at sunset, and the bartenders pour the drinks strong! 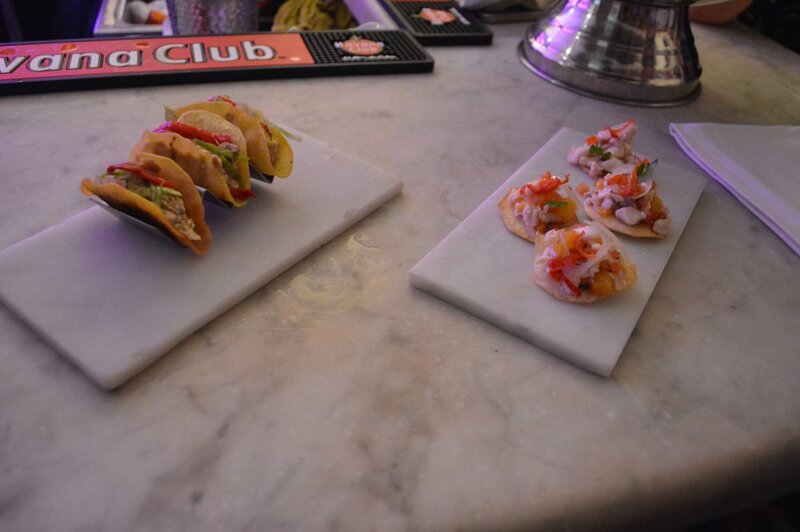 They also have a smaller food menu available for you to choose from. Located right on the Malecon, this was hands down one of the best meals that we ate during our time in Cuba! The food was fresh and cooked to perfection, served up at very reasonable prices (~$4/plate with side)! We opted for the butter grilled fish and we were definitely not disappointed. 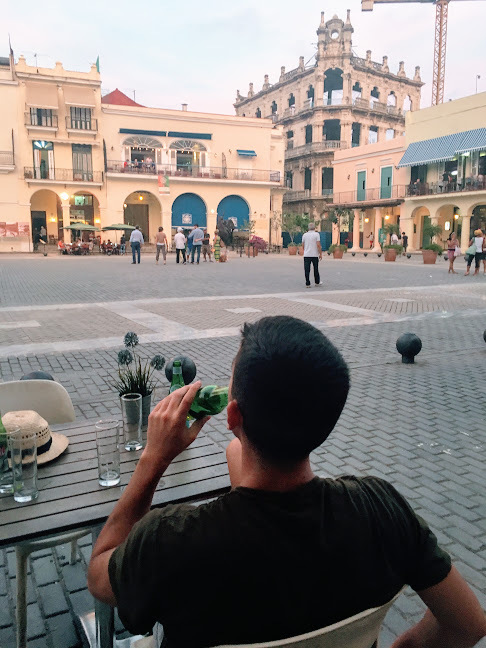 Located in the Plaza Vieja, this is a great spot for a sunset cocktail. The drinks were great and the food is rumored to be superb! We had attempted to grab a drink at the more famous Factoria Plaza Vieja next door, but after an unsuccessful attempt at getting a table, we opted for this cozy cafe instead. 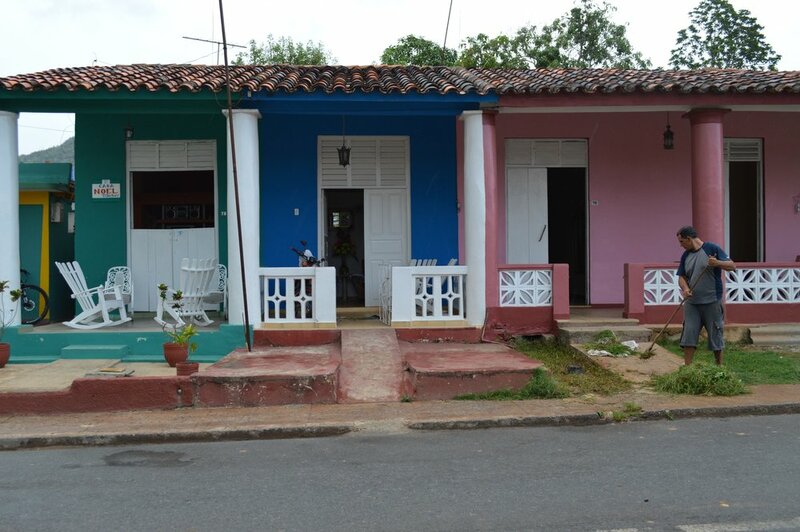 Definitely opt for staying in one of the many casa particulars during your trip to Cuba. 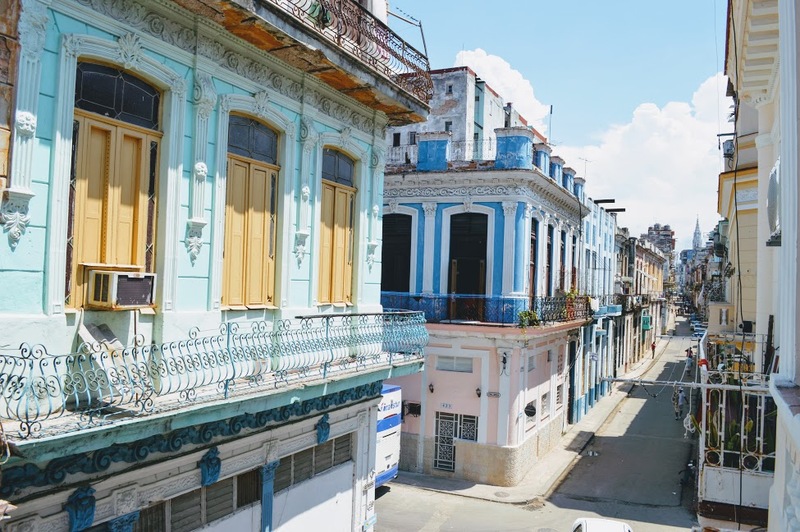 Not only are these accommodations cheap (and there are an abundance of them on AirBnb), but they will also give you a more authentic Cuban experience because you will be actually living with a family. Although there is no shortage of casa particulars in Viñales, I highly recommend staying at Casa La Estancia (host Yuliesky – https://www.airbnb.com/rooms/13549820). Yuli and her husband provided us with such as welcoming experience, not to mention some delicious fresh juice! 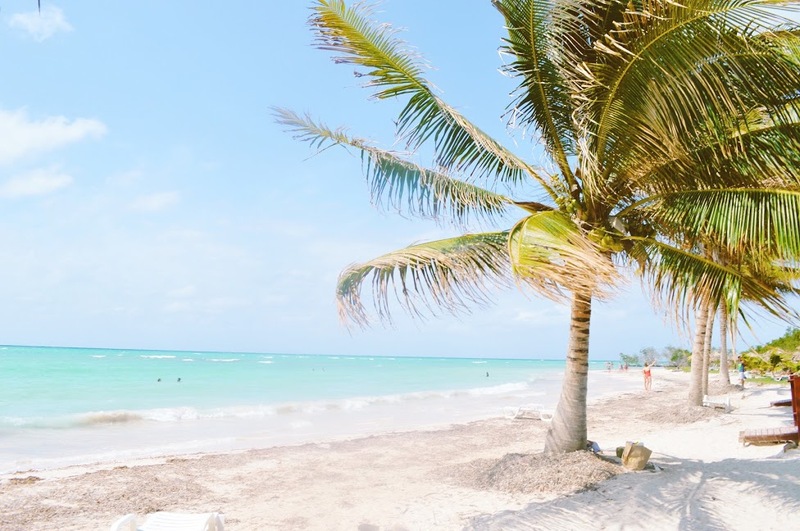 They were so accommodating in helping us to coordinate collectivo transfers to the beach/Havana, as well as with arranging an afternoon horseback riding tour within an hour of our arrival. Due to our limited amount of time in the city, we chose two of the more famous museums: Museo de la Revolucion and Museo de Bellas Artes Cubano. They were both entertaining and highly informative! What better way to see the city then by riding around in one of the 1950s classic convertibles?! As touristy as it is, this was definitely one of the highlights of our time in Havana. There is so much to see on every corner in Havana. We spent hours simply wandering the city in search of the most beautiful streets. The weather was a humid 90 degrees or so, so the many cafes and bars came in handy when we needed to cool down with a local mojito! Definitely make sure to spend some time on the Malecón taking in the beautiful sea breeze! A former horseback rider myself, I was especially keen to participate in one of these tours! The two of us were able to book a private tour on the day of for 25 CUC (~25USD)/person. This was a five hour tour that took you by horseback through the valley, with stops at a tobacco farm, a coffee farm, and a cave. This is an awesome way to experience some of Havana’s countryside. I am a bit hesitant to recommend this experience, but I figure that I should mention it to anyone who is interested. For 20CUC/person you can book a round trip collectivo to and from Cayo Jutias from Viñales. We were told beforehand that the ride takes approximately 45 minutes each way, however due to poor roads we spent over 2 hours each way! However, we noticed that a lot of the smaller cars were speeding right by us, so booking a private car may be a smart option if you’re looking for a beach escape. The beach itself was very beautiful, even though we had the unfortunate luck of rain shortly after arriving. 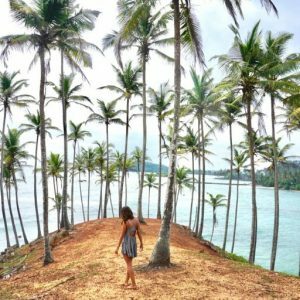 Like what you read about spending four days in Cuba? Make sure to Pin it for later! 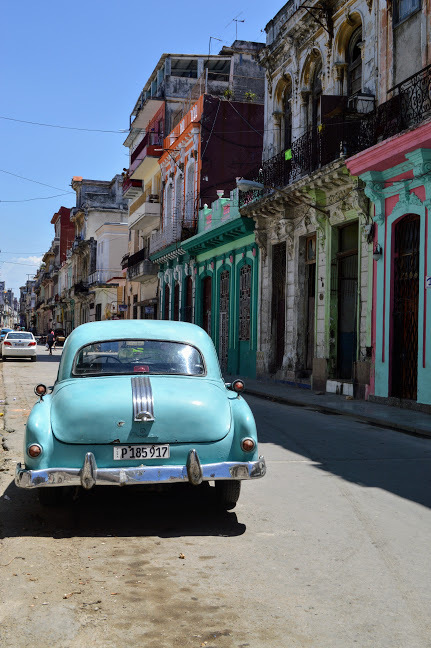 A time capsule is the perfect way to describe Cuba, I was there a few weeks ago and travelled around quite a bit, but this post is really making me wish I went to viales, oh well now i have an excuse to go back!